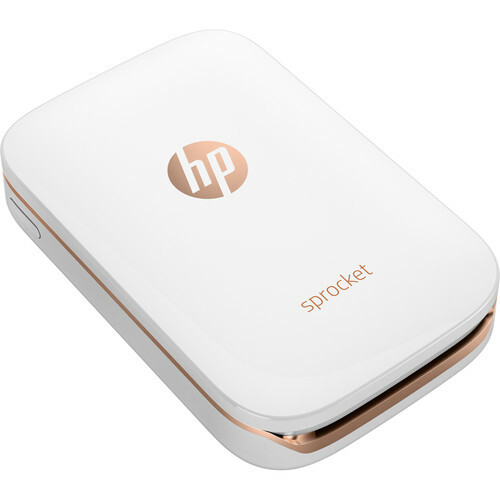 Take the digital memories stuck on your smartphone and turn them into tangible, physical prints wherever you go with the white Sprocket Photo Printer from HP. Super compact and weighing just 6 oz, the Sprocket is designed to go with you everywhere so you can immediately share prints with your friends as you make new memories. Also, it uses a dedicated companion app for iOS and Android that allows you to set up print jobs, add filters and edit your photos, and pull images from social media. Box Dimensions (LxWxH) 6.35 x 3.8 x 1.5"
Sprocket Photo Printer (White) is rated 4.4 out of 5 by 149. Rated 4 out of 5 by softballchik24 from Quick, Easy Photos Everywhere We are always on the go with family and friends and the Sprocket has proven itself to be a great asset. No matter where we are, we take a lot of pictures and having the ability to print those photos right on the spot without any ink is so cool. The Sprocket is small enough to fit in your pocket and prints some great photos. With the special Zink photo paper that keeps the Sprocket simple. The size makes the Sprocket perfect on the go and the app allows you to create fun pictures that will be cherished forever. I just wish there was an option for larger photos from time to time. Still, I love taking my Sprocket with me and printing photos on the spot for people. Rated 5 out of 5 by Trish45 from Great idea The Sprocket is an awesome little printer. I love having a little printer to use to print off pictures I want to make a collage with, use the pictures in a scrapbook or journal. Once the pictures are placed, make sure that is where you want them because there is no moving the pictures once they are placed. The sticker paper is very good at sticking. I do have trouble with editing and resizing with the iPhone app. I did find a Sprocket app for the iPad, but when connecting the iPad and Sprocket, a warning comes up that the IPad is not compatible...so whats the use in having an iPad app then???? Still a great idea and love my Sprocket. Rated 5 out of 5 by suziezephyr from Love it for my autistic son! We purchased sprocket and paper for my son's birthday. We set it up in advance to work with his ipad--this was easy. We added a notebook with only plastic dividers, labels and a pen. When he unwrapped it we labelled one divider 'Birthday', turned on the sprocket and had him take pictures of everyone there and print it. We immediately pulled off the sticky back so he could stick it on the plastic page and wrote a label. He now has a functional album that he built himself so anyone can read it to him. It was seamless. My only suggestion is that you make the peel off back easier so he could do it. Or heck, so it doesn't take me so much effort. Rated 5 out of 5 by cnbg from Great Printer I bought this for myself thinking it might be useful in my scrapbooking efforts. It's awesome!! Very easy to use, the prints are pretty sharp and the sticky back works great for my needs. I have not had any issues with the print quality nor reconnection problems that others have noted. I'm so glad that I checked the website again (they had been out of stock and this time it was in stock and the delivery was super fast). I love this little printer and it's so much fun. Apparently this printer is very popular and everybody wants one, glad I got mine!!! Rated 5 out of 5 by TheTechReverend from This product is the Best kept secret alive I did not know what to expect when I ordered this product and was pleasant surprised when I opened the instructions and read how simple it was to operate it. Not only that but the product is inkless and it prints within seconds of queuing a print job. The convenience of printing from my phone straight to a handheld printer is simply awesome and amazing. Add to that the coincidence of hosting a brunch where we gave away souvenir magnet photo frames that required 2x3 prints. With this product we were able to print photos on the spot!!!! I can't say enough good about this product. Thanks HP for making my day. Rated 2 out of 5 by TC023 from Constantly restarting device Bought this for our wedding for the guest sign in and to send photos w thank you cards. Worse purchase ever. Took so long to print that guests were having t o wait at least 10mins for the photo to print. We only have 12 in our guest book. Now when printing at home, I'm constantly having to restart the printer or delete the print que and restart the process all over. To print 25 photos it has taken me 4 hours. I'm so disappointed in this product and would not recommend if you want fast print. Yes, the firmware is up to date and I thought maybe that would solve my issues, but the experience feature now has caused longer wait times when printing. Rated 5 out of 5 by Pickett from A great printer! I recently got this printer, and I LOVE it! It is super convenient to be able to print photos from home and out and about with no problems. I wasn't expecting as high quality photos as it prints due to there being no ink required. But I was wrong, it certainly exceeded my expectations, and I have been printing like crazy! I recommend this printer, especially if you want to print on the go, or do crafts with photos like I do. The sticky backed paper is extremely useful. My favorite features are: -You print via Bluetooth instead of using wires. -The printer itself is very small and portable, only about the size of your phone. -There is no ink required, so you don't need to worry about smudging or replacing. -The back peels off and makes the photo a sticker. -You can edit and add frames, stickers, or text in the app. -The prints are high quality and true to color.